not only contain salt and limescale, but also marine growth of all kind. All these can settle in the cooling loop, often in great quantities. As a result the cooling performance decreases. Therefore the engines can’t run on full speed to avoid overheating. To reduce the risk chemical cleaning is done regularly. 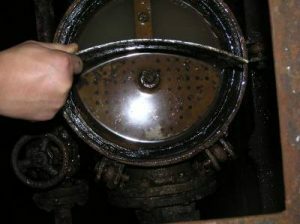 Merus Ring achieved good results in many different diesel engines on ships as well as oil platforms. Where sea water is used directly to cool down machines and engines we are able to reduce problems caused by limescale, corrosion and also barnacles. All these different substances have a similar effect on the system as described above. As in all other applications the Merus Ring prevents deposits caused by limescale and corrosion. Therefore the inner surface of the pipes is smooth it doesn’t provide grip for barnacles and other organisms. This means that what enters the pipe, leaves the pipe. Without settling, growing and breeding in the system. We achieved good results onshore and offshore (oil platforms, ships) for removing barnacles. 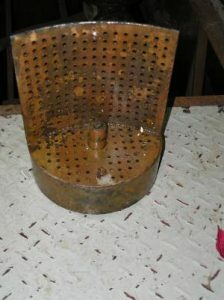 On the first picture you can see a part of the sea water filter where corrosion was stopped after the Merus Ring was installed. The second picture shows the inspection glass of this filter. Before the installation it was not possible to see through through it. Now it is clear again.